Nigel Bond is probably sick of the 007 James Bond puns that have followed him throughout his impressive 25-year professional career. The 48-year-old's decision to explore a coaching role in Russia - a country with a growing passion for snooker - means he is now as good as writing his own script. Bond is enjoying his new venture, but he said it is his "love" for the sport that his been his life for four decades that means he will be returning from Russia to continue his career on the tour. 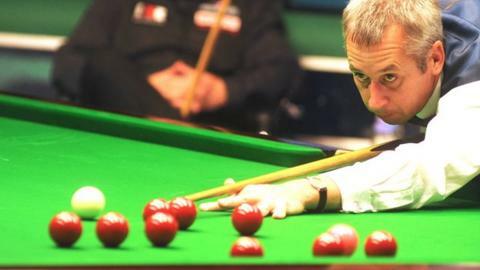 "I do a bit of coaching there," the former World Championship finalist told BBC Sport. "I have been there three times now but things will have to develop a bit more. Hopefully they will set up an academy out there. "The people are really passionate about it and there are a lot of people looking to play it rather than just watch it. "They have mentioned it would be nice to have someone over there part of the time to try to get the young people involved and that is something that could happen in the future. We will have to wait and see." Born: Darley Dale, 15 November 1965. Ranking title wins: Five - Kings Cup 1993, Red & White Challenge 1995, Malta Grand Prix - 1996, Scottish Masters 1997, World Seniors Championship 2012. Other success: Bond has reached four other ranking event finals, including the 1996 World Championship, where he lost to Stephen Hendry. In the meantime, the Derbyshire cueman is still getting a buzz and excitement from mixing with the world's best and pushed world number 16 Graeme Dott all the way in the second round of the UK Championship before losing 6-5. Bond's ranking has slipped to 49, but he has won two tournaments in the past two years - the World Seniors Championship last year and the Snooker Shoot-Out in 2011. "I am still enjoying the game," Bond added. "There is no substitute for winning. There is no better feeling. "I have had a couple of nice victories over the past couple of years, winning the shoot-out and also winning the seniors last year as well. "I wouldn't swap that. It's been a great life. This is my 25th season as a pro and I still really enjoy it. "Sometimes we all have a little bit of a moan and get a big grumpy about things, but we are all doing something we love doing and that's the way you have to look at it." Bond admits finding his form can seem a lot harder than at his peak in the 1990s. During that period, Bond who lives in Old Tupton, reached five ranking event finals, won one ranking title and spent seven years in the world's top 16 from 1992. This season has been tough. Bond reached the last 16 of the First European Tour event in Bulgaria in June, but his only noteworthy tournament display since came in the World Seniors Championship in October when he was beaten by Steve Davis in the final. But he got a great deal of pleasure out of his victory over Craig Steadman in the first round of the new-look UK Championship in York and is not contemplating retirement, even though he admits it can be a struggle still competing at the very top of the game. "I enjoyed it," he said. "But sometimes it is really, really hard. It's not the motivation, it's when you are struggling for victories like I have been this season, it just feels difficult. Every shot is like a pint of blood. "It's nice to be able to play with freedom and sometimes I haven't got that - I just haven't." Bond says the lack of freedom is partly down to the new 'survival of the fittest' approach championed by World Snooker chairman Barry Hearn. "You are not guaranteed any prize money and if you don't win you don't get paid so we are under a lot of pressure," Bond said. "Where I am ranked I have to go through the qualifiers whereas normally the top 16 are in at round one. But they have no privilege at this tournament [York]. "One or two players have been outspoken believing they have earned that right to be in the top 16 and to be seeded. But everyone is in the same boat so we have to go with what Barry Hearn says really. "If I was in the top 16 I probably would be a bit peeved by the fact I am not seeded through. But if you are going to win the event then you know you have to beat everybody." Bond is still keen to rise to the challenge provided by players who are often less than half his age. But the possibility of making the most of snooker's growing global appeal is also at the back of his mind when he finally contemplates life beyond the pro tour. "I would find it very hard to live in Russia permanently obviously with the language problem and stuff like that," he said. "But I would consider living part of the time over there, definitely."